Check this post as COP approaches for details about additional events and updates. CCROM SEAP in collaboration with Oscar M. Lopez Centre (OML) Philippines, Southeast Asia Regional Center (START), CERED, and Asia Pasific Network (APN) will host the Regional Workshop on Loss and Damage, Climate Change Adaptation and Disaster Risk Reduction in Southeast Asia for the project entitled “Assessing the Linkages between Climate Change Adaptation (CCA), Disaster Risk Reduction (DRR), and Loss and Damage (L&D): Case Studies in the Low-lying Coastal Cities of Indonesia, Philippines, Thailand, and Vietnam” on April 19 – 20, 2016 in Bogor. The regional meeting aims to get together all collaborators and selected experts to discuss initial findings of country assessment and case studies, develop country and regional frameworks, and set goals and way forward of the project. In line with this, CCROM with Columbia University, UNORCID and UNOPS will organize three days training on the GAMBUT project and on the use of the Fire Risk System (FRS) targeted for the project team members and relevant partners on 12 – 14 April 2016 in Bogor. The objective of this training is to provide the overview of the project, technical discussion on how to use the FRS, and overview on how the system can be effectively mainstreamed at the national and subnational level. By the end of the training, it is expected that all GAMBUT members will have a thorough understanding of the upcoming implementation activities and the usage of FRS, as well as GAMBUT operational related issues. Many countries and subnational jurisdictions are constructing REDD+ reference levels for carbon stores and fluxes in forests and other land uses. This course will provide students with the skills needed to build statistically rigorous REDD+ reference levels and terrestrial carbon accounts that can be eligible for pay-for-performance funding. The course will follow the IPCC Good Practice Guidelines and help students learn and master World Bank Forest and Carbon Partnership Facility methodological guidance on REDD+ reference levels. Students are encouraged to bring their own data to receive individualized training and support for building credible REDD+ reference levels that include uncertainty and error propagation. Instructors will provide templates for students to compute their own statistically rigorous reference levels that can be shared with domestic and international policy communities. There are no prior math or statistics requirements for the course and students will be provided with review materials in advance. Students will receive 4 days of instruction, beginning at 9:00 am on October 14, 2014 and ending with graduation at 1pm on October 17, 2014. Students who successfully complete the course exam will receive a Certificate in Terrestrial Carbon Accounting Statistics from the Carbon Institute, the Greenhouse Gas Management Institute, and the Centre for Climate Risks and Opportunity Management. 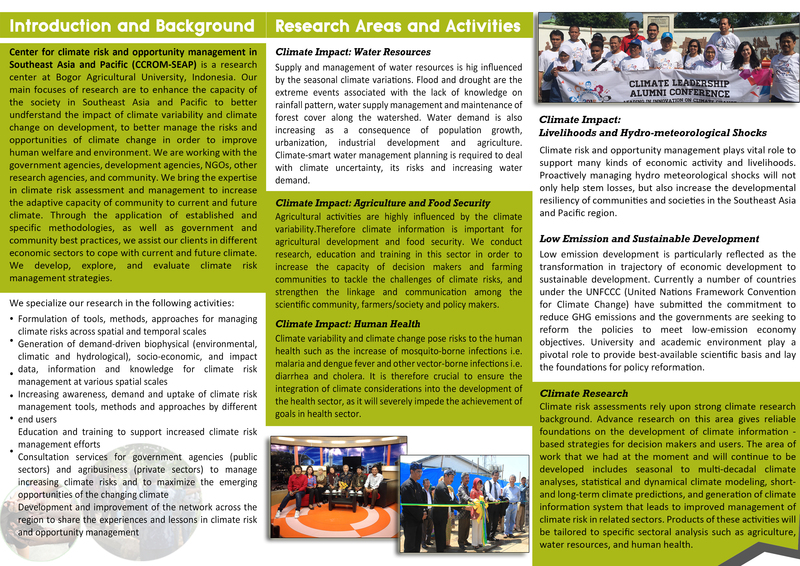 Download course flyer for more information and GHG Institute web. In September 2011 Indonesia government issued Presidential Decree No. 61/2011 as a strong legal support on National Action Plan to Reduce GHG emissions (RAN GRK). The decree orders all provinces to develop Provincial Action Plan (RAD GRK) for translating the program into sub-national levels. These actions plans should be in light of President commitment to reduce national emissions by 26% by 2020 or up to 41% with international supports, while keeping up with 7% annual economic growth. Highest emissions in Indonesia come from conversions of peat land and forest to other uses (SNC, 2010). Land-based emission reduction will contribute 80-90% of national reduction. This indicates that changes in development planning, both at national and sub-nationals are necessary. Local authorities and relevant stakeholders including private sectors play an important role to make sure the effective translation of RAN GRK into RAD GRK and complete realization of the actions. In addition, Indonesia REDD+ work has begun. There is a clear need for improving the capacity of carbon professionals, not only on the technical aspects of carbon accounting but also the policy context and negotiation issues. 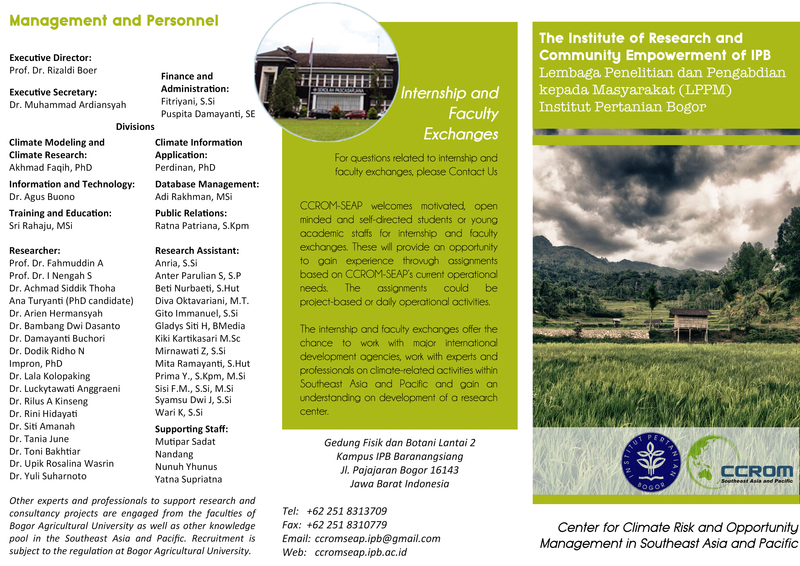 Targeted participants for this first training are Indonesian carbon practitioners, both from governmental and non-governmental organizations. Total teaching time in 4 days training is 26 hours, which is equivalent to 3 credits. In order to get certification, students need to follow all training schedules including lectures, group works and evaluation. Sonya Dewi, Senior Staff at World Agroforestry Center (ICRAF). This training costs Rp. 5,000,000,- including participation fee, training materials, and accommodation. Registration without accommodation is possible, please contact us for more detail.